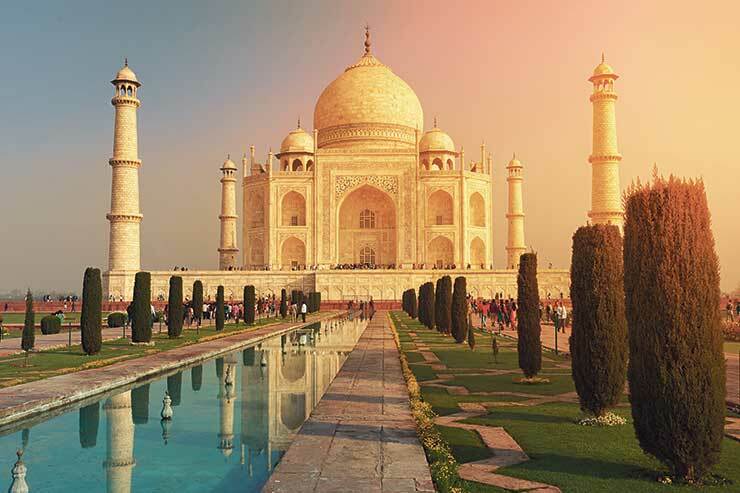 From forts to palaces and mosques to markets, Abra Dunsby from TTG marvels at the sights and sounds of India’s Golden Triangle on a Riviera Travel fam trip. I’ve never been so happy to be stuck in traffic. I crane my neck to catch a final glimpse of the elephant marching triumphantly past my window, draped in a velvet blanket, its wrinkled face and trunk painted with flowers. Unlike a schlep on the M25, road journeys in India come with impressive views, as we discover on our fam trip of the Golden Triangle with Riviera Travel. Sari-swathed women perch side-saddle on mopeds, cradling their babies as their husbands dart through the traffic. “The most I’ve ever seen was five on a bike, with a baby in a bucket hanging from the handlebars,” chuckles Mayank. Traders troop past our windows flogging everything from coconuts to poppadums, sauntering cows stop traffic, and barbers lather up their clients’ stubbly faces by the roadside. India’s popular Golden Triangle route – visiting the north-western cities of Delhi, Agra and Jaipur – is a wonderful introduction to the country’s colour, culture and chaos. For clients who find the thought of going it alone here overwhelming, an escorted tour along this well-trodden tourist trail is a great option. Clients stay in hotels ranging from the Taj Palace in New Delhi to the Trident Hotel in Agra, each with their own distinct style and offering a relaxed refuge from the bustling streets outside. Delhi, home to more than 17 million people, is a city of dazzling extremes: splendour and poverty, colour and smoggy skies, ancient and modern. In New Delhi, we stroll along neat, tree-lined boulevards, past the faded colonial-style buildings designed in the 1920s and 30s by British architect Sir Edwin Lutyens. The area is also home to Qutab Minar, a soaring 73m-high red sandstone tower erected by sultan Qutab-ud-din Aibak in 1193, its storeys intricately inscribed with verses from the Qur’an. 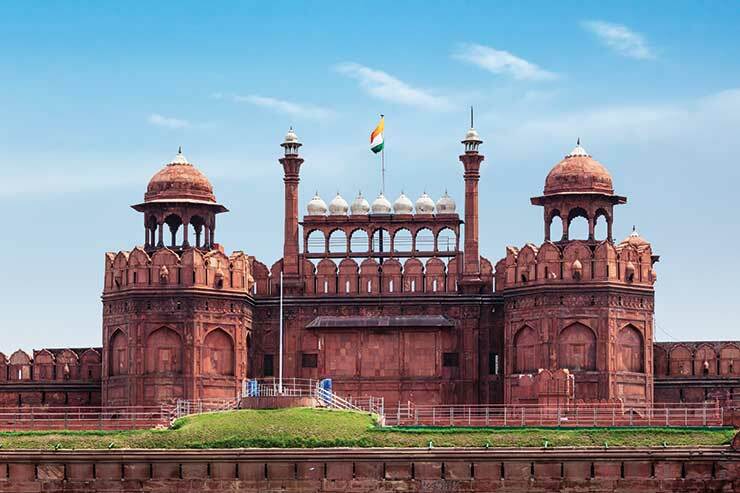 Old Delhi also impresses with its grandiose sites, from the arching terracotta palaces of Mughal emperor Shah Jahan’s Red Fort, to the vast onion-domed mosque of Jama Masjid, which can hold up to 25,000 worshippers. Historical buildings aside, Old Delhi’s charm lies in its tangle of narrow streets, where car horns beep, glinting bangles and saris fill shop windows, and the smell of street food lingers. We experience the hubbub first-hand on a rickshaw ride through Chandni Chowk, a clamorous market street lined with shops and stalls, where monkeys swing from phone wires clutching fruit they’ve plundered from shrieking traders. Agra is home to India’s defining landmark, the Taj Mahal, and our visit is an indisputable highlight of the tour. After taking electric cars to the entrance (they protect the Taj from pollution), we catch our first glimpse of it, poetically framed by an arch. The hype is justified – the Taj Mahal is impossibly, ethereally beautiful, and it’s rendered even more so by the love story it embodies: that of emperor Shah Jahan and his favourite wife, Mumtaz Mahal, who died in childbirth. The mausoleum is a labour of love that took 22 years to construct, and its lavish stonework and pure symmetry is mesmerising. While crowds are inevitable, Riviera’s tour visits at sunrise, when there are fewer tourist gaggles and the morning light intensifies the marble’s creamy lustre. Just outside of Agra is another architectural feat, Fatehpur Sikri, built by the Mughal Emperor Akbar as his capital and palace in the late 16th century. He deserted it soon after due to water shortages, and it is eerily compelling to walk through the red sandstone palaces and mosques, imagining its former opulence. The four-hour drive from Agra to our final stop, Jaipur, has me enraptured again. We roll through tiny, forgotten villages where kids play in streams and weathered old men sell mangoes. As the landscape changes to dusty countryside, the trucks that barrel past become ever more lavishly decorated. Bumpers are emblazoned with the words “beep horn please” (hence the near-constant tooting) and are decorated with swinging pendants to ward off evil spirits. With its teeming bazaars, palaces and temples, our arrival into Jaipur, Rajasthan’s capital, is just as beguiling. The Maharaja had the city’s buildings painted a rosy shade to welcome Prince Albert in 1876, earning it the moniker “The Pink City”. The architecture is magnificent, and the best way to take it all in is to simply wander the streets. The Hawa Mahal, or Palace of Winds, is an extraordinary five-tiered peaches-and-cream palace that reminds me of an elaborate wedding cake. Mayank explains that its shape allowed the women of the Maharaja Sawai Pratap Singh’s household to watch the street and the various festivals that take place without being seen. Of all the elaborate rooms and courtyards, which the maharaja and his wives and concubines once called home, the hall of mirrors is my favourite – the perfectly placed shards make up a glinting sea of patterns and mosaics that climb from wall to ceiling. Our bags weighed down with market purchases of scarves, bangles and statues of the elephant god Ganesha, we retreat back to the bus for our trip to the airport. We’re accompanied once again by the wonderful Mayank whose facts, stories and cultural quips have brought India bursting into technicolor for all of us, educating us about everything from yoga to arranged marriages and the caste system. On one journey, he hands me a newspaper, pointing to the marriage adverts placed by parents for their children, stating their age, education, job, caste and star sign. “The person we marry has been partnered with us based on many criteria to ensure a good match, and we can help choose. There are so many dating sites in the world these days, this isn’t much different,” he shrugs. For the final time I press my face to the window, taking in the colour and the noise, the riches and the heart-breaking poverty. It feels a world apart from the UK – and that’s exactly the intoxicating, one-of-a-kind joy India delivers. Book it: Riviera Travel’s 11-day India Tour starts from £1,499pp* including Virgin Atlantic flights from Heathrow.